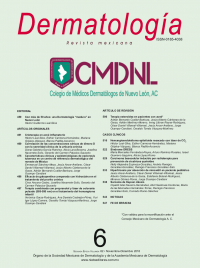 Clinical and epidemiological characteristics of tuberous sclerosis in a dermatological center in the northeast of Mexico. Efficacy of gabapentin compared to hydroxyzine in the treatment of chronic pruritus. Combined therapy with propranolol and pulsed dye laser (585-595 nm) in the treatment of infantile hemangioma. Corticosteroid therapy in patients with acne. Epithelioid hemangioendothelioma resected with CO2 laser. Basal cell carcinoma induced by radiotherapy for preventing keloids. Hypertrichosis due to absorption of minoxidil in a pediatric patient.